I was only barely successful in my career as a musician who uses a wheelchair, and since I only performed locally and regionally, long road trips were uncommon. But I distinctly remember that emotional shift from cheering crowds to the silence of myself, my issues, alone. I had my center already figured out, though, and it wasn’t so much for me. I got to hear Vic a lot, and see him once. I miss his wailing vocals and poignant songwriting. He was a bit of a dark and morose person before his disability and that was his approach to songwriting and music. It always urks me that many people thought his genius was always and directly about life as a para, and his death was portrayed that way as well. When I did see him live, I noticed him after the show with a look of foreboding on his face. I thought at the time about the very notion that you have described so well. Thank you, Mark, excellent article. 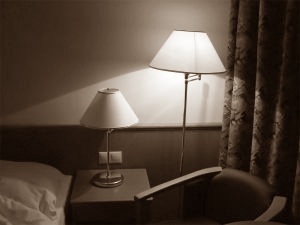 Even without physical disabilities, the emotional disabilities challenge,harass,steal, and taint our lives daily, I know too of the lonely room, the nights on the road, entertaiment, friendship new or existing, laughter,sharring of events past and present each other’s lives and the finality of the lonely room. Some make it to morning, to rise again to face the world, others may give up, tired of the fight, tired of facing another day of challenges. To those who are tired I will encourage them to give it one more try, maybe a new outlook, theme, or desire will make it that much more in our personal lives and our effect we have on others. Make it a positive for all concerned.